There has been a Methodist Church in the village for about 150 years and the current building was opened in 1977. The number of people attending the new church building in 1977 increased rapidly, so a new school room was built and opened in 1978. Further expansion in activity led to the construction of additional rooms in 1985; and in 2000 there was additional building to include an extended worship area, a large modern kitchen, a foyer with disabled access, disabled toilets and shower, and an extension to the upper meeting room. The Methodist Church has its roots back to 1739 where it developed in England following the teachings of John Wesley. While studying at Oxford University, John Wesley and his brother Charles, along with fellow students formed a group devoted to prayer and helping the underprivileged. Both brothers were already ordained in the Anglican Church but their evangelistic preaching was not popular in most pulpits. They therefore preached in homes, farm houses, barns, open fields and wherever they found an audience. The brothers did not set out to establish a separate Christian denomination, but Methodism spread and eventually held its first Methodist Conference in 1766. It is not clear when a 'Methodist Society' was formed in Haslingfield, but by 1860 it was sufficiently well established to want a chapel building of its own. Before that, no doubt as in most village societies, they met in each others homes. The original building was constructed in 1867 from contributions of its members who were almost entirely farm hands and other low-paid workers. The original chapel was 18 feet by 28 feet in size, with no kitchen, no water and no toilets. 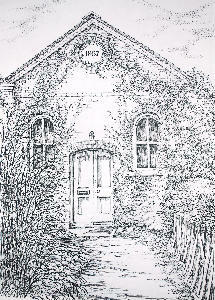 The building still exists today and is behind a row of cottages on Haslingfield High Street.